Dr. Levent Piker graduated at the Institute for Marine Sciences, University of Kiel (Dipl. Biol., Biological Oceanography, Marine Chemistry, Zoology) in 1990. Consultant at the Environ-mental Agency of City Kiel (1990-1991). Employed as a scientist at the Research Center for Marine Geosciences (GEOMAR; 1991-1994) and at the Institute for Marine Sciences, Kiel (1994-1996, as chief scientist). He is currently owner and executive director of the companies Coastal Research & Management GbR (CRM) and O'Well – Ocean Wellness GmbH. CRM, based in Kiel-Holtenau, Northern Germany, was founded in 1994 by an interdisciplinary working team of biologists, engineers, hydrogeologists and chemists. CRM works on projects in the field of Integrated Coastal Zone Management (ICZM), particularly in the range of ecological and hydrogeological aspects aiming at the development of distinct mitigation strategies while also contributing to a general scheme of ICZM. CRM provides consulting, studies, ecological impact assessments, planning, research and development. O'Well – Ocean Wellness GmbH also based in Kiel, was founded in 2001 in order to market products from living marine resources and technologies developed by the sister company CRM. O'Well comprises three divisions -Ocean Actives, Ocean Cosmetics, Ocean Biotech – offering its own natural marine cosmetic O'Well, different marine extracts as well research & development in medical applications of marine substances. PhD thesis in 1995 on anaerobic decomposition of organic matter in eutrophicated marine sediments. Collaboration in two interdisciplinary projects funded by the German Federal Ministry of Research and Technology on sediment quality and mobilisation of heavy metals, and on eutrophication effects on the North Sea and the Baltic. 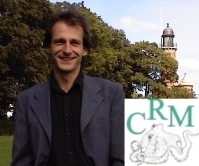 Dr. Levent Piker is founder and shareholder of CRM working on various aspects of anthropogenic impacts on marine ecosystems (e.g. harbour building, fishery, aquaculture, tourism) and ICZM (e.g. development of ICZM plans and voluntary agreements for German Baltic Sea Protected Areas, HELCOM Recommendation 15/5) aiming at a sustainable use of coastal and marine resources. Realising the lack of communication between different levels of decision making and between different groups of stakeholders as one of the main obstacles in the sustainable development of coastal regions he works on overall ICZM solutions for regional planning (expert systems, data bases, mediation) while also developing distinct applications for a sustainable use of coastal resources, e.g. integrated aquaculture of indigenous seaweed and mussels (funded by the German Foundation of Environment). Founder and shareholder of Ocean Wellness GmbH, developing and selling products made of marine natural substances. Several studies and publications on pollution, ecotoxicity, benthos and aquaculture impact. Member of the Society of Marine Sciences (DGM), the Association of General and Applied Microbiology (VAAM), the Working Group on ICZM in the K.E.R.N. (Kiel, Eckernförde, Rendsburg, Neumünster) region and “Sea Future” group in Schleswig-Holstein, the “Maritimes Forum Kiel” and the “Maritime Consulting Group”. Co-founder and member of “Transmare e.V.”, an NGO, which informs and educates on marine issues with respect to AGENDA 21 (Chapter 17).